JACKSONVILLE, Fla. - The next Family Movie Night presented by Fun 4 First Coast Kids at the Baseball Grounds of Jacksonville is set for Saturday, Sept. 22. 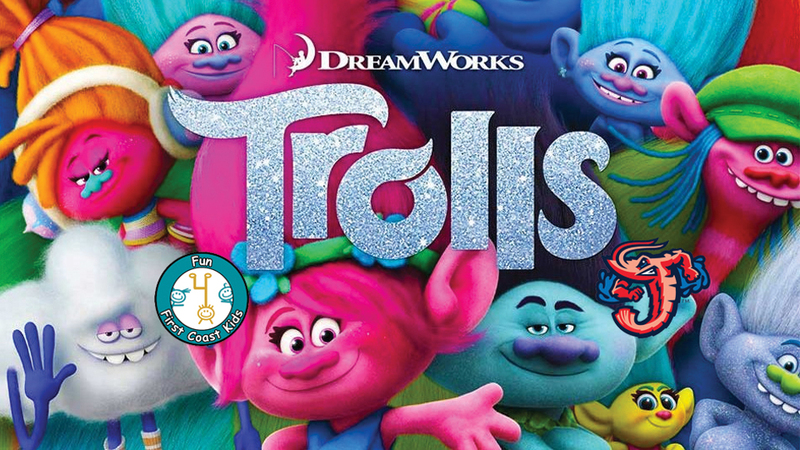 The Jacksonville Jumbo Shrimp will show a screening of Trolls on the high-definition video board at the Baseball Grounds of Jacksonville. Admission is just $1 per person at the gates, but the Jumbo Shrimp request RSVPs through this link, which is also available at www.jaxshrimp.com. Gates open at 6 p.m., with free kids activities including face painting and pictures with Jumbo Shrimp mascots Scampi and Southpaw until 8 p.m. Admission is $1 per person at the home plate gate, while concession stands, Kids Zone inflatables and the Jumbo Shrimp souvenir store will be open. Those who RSVP here will be automatically entered to win raffle prizes given away before the movie begins at 7 p.m.
Birthday party packages for the event are available by calling Ashley McCallen at 904-224-8533. Reservations are due by Wednesday, Sept. 19, and include access to the Movie Night, hot dog, chips and drink, and an unlimited Kids Zone inflatables pass for the night for $15 per person (minimum 12). Movie night attendees may sit on the field, and the stadium seating bowl will be open for seating. There is stroller- and wheelchair-accessible seating available both on the field and in the stadium seating bowl. Attendees are welcome to bring blankets for seating on the field. However, no chairs will be allowed on the field.